Does Utah&apos;s air pollution increase school absences? Wasatch Front students miss class at soaring rates when pollution spikes, a Tribune analysis shows. Francisco Kjolseth | The Salt Lake Tribune Andrew Gardner contributes to a group science project at Albion Middle School via &qu Francisco Kjolseth | The Salt Lake Tribune Meghan Hawkesworth, 12, answers a science question in class while sitting next to cla Francisco Kjolseth | The Salt Lake Tribune They call him the "iStudent." Andrew Gardner, 12, nearly drowned on a rafti Francisco Kjolseth | The Salt Lake Tribune Andrew Gardner joins classmates in a group science project via "Facetime." 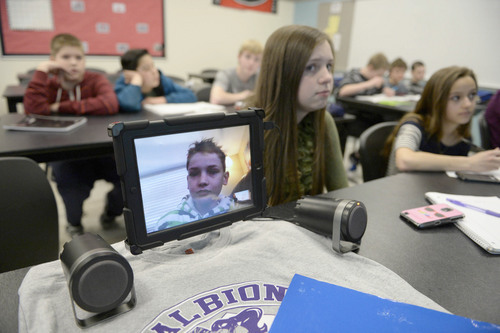 Francisco Kjolseth | The Salt Lake Tribune Andrew Gardner contributes to a group science project at Albion Middle School via "Facetime." The 12-year-old Sandy boy nearly drowned on a rafting trip three summers ago, permanently damaging his lungs. To escape Utah's winter pollution the 7th-grader takes temporary refuge in Arizona. Francisco Kjolseth | The Salt Lake Tribune Meghan Hawkesworth, 12, answers a science question in class while sitting next to classmate, Andrew Gardner on screen. Gardner nearly drowned as a child, permanently damaging his lungs. To avoid Utah'spollution-trapping inversions he spends much of the winter ine Arizona with his grandparents. Francisco Kjolseth | The Salt Lake Tribune They call him the "iStudent." Andrew Gardner, 12, nearly drowned on a rafting trip three summers ago, permanently damaging his lungs. To escape Utah's winter pollution the 7th-grader takes temporary refuge in Arizona. His science teacher videoconferences him into classroom discussions. 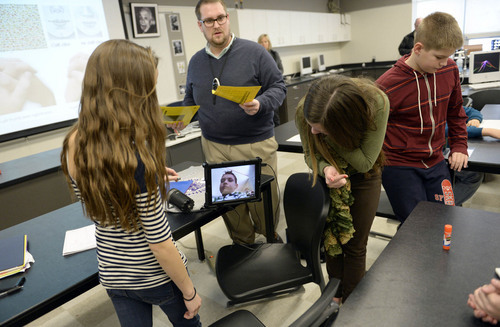 Francisco Kjolseth | The Salt Lake Tribune Andrew Gardner joins classmates in a group science project via "Facetime." The 12-year-old nearly drowned, permanently damaging his lungs and making him susceptible to Utah's winter pollution. Per doctor's orders he spends several weeks in Arizona with his grandparents. Sandy • It&apos;s the start of a new science chapter on genetics, and Matt Reynolds urges students to quickly take their seats. "Andrew, are you with us? 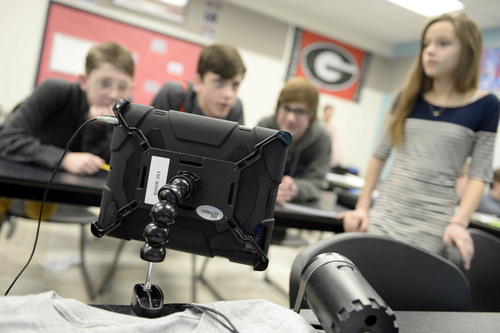 There you are," says the Albion Middle School teacher, reaching to turn up the sound on his "iStudent"  12-year-old Andrew Gardner, who was beamed from miles away to a smart tablet atop a desk at the front of the class. Utah&apos;s polluted winter air forces Andrew, who has a permanent lung injury, to seek refuge in Arizona. The seventh-grader missed nearly a month of school last year. So far on this February school day, he&apos;s missed eight days of classes, and it&apos;ll be another two weeks before he can return. Video conferencing him into class is a rare accommodation, but his absence from the classroom is not so unique. Health problems are a known contributor to absenteeism, and Wasatch Front students miss class at soaring rates when pollution levels are at their highest. That&apos;s according to an analysis of attendance records by The Salt Lake Tribune in collaboration with Brigham Young University economist Arden Pope, one of the world&apos;s leading pollution scientists. The Tribune obtained daily counts of school absences in 2012 and 2013 at four school districts  Salt Lake, Provo and Alpine, where residents endure winter bouts of unhealthy air, and Park City, which rests above the valley haze. Pope plotted the absences against daily pollution counts, or the average daily measures of hazardous fine particulates. There appears to be a link between pollution and student absenteeism during the record-setting winter of 2013, preliminary findings show. The previous year, there was only a single day when Salt Lake County&apos;s air exceeded federal clean-air standards for microscopic soot particles called PM2.5. But there were 22 days with such poor air during the 2013 inversion season. The Salt Lake Valley region was singled out by the U.S. Environmental Protection Agency that year for having the nation&apos;s worst air for much of January. And during that inversion season, the number of elementary students absent from school shot up in Salt Lake City  and in nearby Provo and Alpine districts, where pollution spikes were even more pronounced. "It&apos;s hard for me to believe all of this is air pollution-related," said Pope, noting more analysis is needed to account for influences such as flu outbreaks and jumps in absenteeism near holidays and weekends. "But you can see school absences were up during that time frame in a way that we just didn&apos;t see the year before," he pointed out. Meanwhile, in Park City, where the air actually improves during valley inversions, school absences showed no such spikes. Missing students • There&apos;s a large and growing body of research, much of it produced by Pope, tying pollution to hospitalizations for respiratory problems and deaths from lung cancer and disease. But calculating the economic and social toll of those health harms can be difficult. School absences are of interest to researchers because the direct costs of lost "seat time" are more easily traced. Studies show children who miss a lot of school achieve poorer grades, lower test scores and are more likely to drop out, limiting their economic potential. Then there&apos;s the added cost to parents who have to miss work, and to school districts. "Any time a student misses instruction it&apos;s a cause for concern because they&apos;re not in class and they&apos;re not learning," said Jo Ellen Shaeffer, an administrator at the Salt Lake City School District. But chronic absenteeism  missing at least 10 percent of the school year or 18 of the 180 days mandated in Utah  is of particular concern, she said. "If a student regularly misses that much school, he will be a year behind by the time he reaches eighth grade." 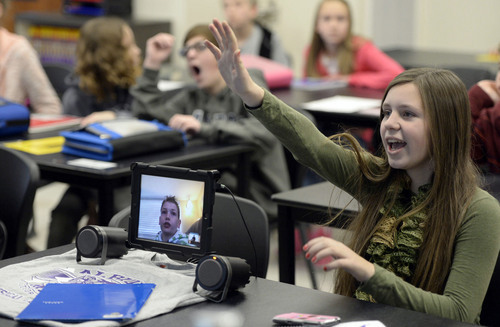 Utah schools don&apos;t lose state funding for excused absences, such as for an illness  as long as students maintain regular contact with their teachers. But consider that on a single day in January 2013, three days after pollution peaked at 69.2 micrograms per cubic meter of air, the Salt Lake City District recorded 2,380 absences  17 percent of its entire elementary school population. Public schools that year were allocated $15.79 a day per student in state funding, equating to $37,580 in wasted resources. In the much larger Alpine district, pollution reached a whopping 123 micrograms per cubic meter of air, well above the federal safe air threshold of 35 micrograms  and the costs were magnified. Five days after pollution hit that peak, 3,467 students were absent, 8.5 percent of the district&apos;s elementary students. Twelve days later, 3,689 students were absent  translating to a total of about $113,000 in wasted dollars. Assessing air&apos;s role • Clearly, not all those absences were linked to bad air. Teasing apart the interrelated factors that contributed to Utah&apos;s absenteeism spike in 2013 may not be possible with only a few years of data, Pope said. When determining what role air pollution played, he said, the "most troublesome" issue is, "do we have epidemics of flu or other viruses that just happen to coincide with periods when air pollution was high?" Even then, pollution could aggravate such outbreaks. "There&apos;s evidence that exposure to fine particles reduces one&apos;s ability to fight off viral infections, so even if [an absence] is due to the flu, exposure exacerbates the disease so you get more of an influenza effect" on attendance. Students miss school for a variety of reasons, including illnesses, transportation problems, instability in housing or because their parents don&apos;t prioritize education, said Hedy Chang, director of Attendance Works, a nonprofit that urges schools to keep better tabs on chronic absenteeism. "In Oakland, Calif., when you geo-map chronic absences, it&apos;s amazing how much it follows the freeway corridor [where traffic pollution levels are highest]," Chang said. "But those neighborhoods are also impoverished food deserts [lacking ready access to unprocessed food] and they&apos;re not terribly safe." A handful of studies has linked air quality to student absences  a problem mitigated at some schools by having health clinics and nurses on site to help children with respiratory illnesses or by installing better ventilation systems. The sources of absenteeism vary from one school to the next, Chang said, and so must each solution. &apos;Show us your tongue&apos; • For Andrew Gardner&apos;s teachers at Albion, the solution includes emailing him written copies of lectures and assignments. Reynolds, his science teacher, records some of his lectures, complete with interactive slide presentations, and puts them on YouTube. "I love using multimedia because it&apos;s just how this generation learns," he said. He first used "Facetime" to enable Andrew, who he says "always asks great questions," to participate in a test review. "It helps me to where I don&apos;t fall behind. I get all my work done and I get to see my friends and stuff," said Andrew. "It&apos;s hard when the teacher isn&apos;t teaching you and you&apos;re just getting the PowerPoints." "Facetime" doesn&apos;t replace seat time and might not work for less-motivated students, said Reynolds. "But for students who want to be in class, we&apos;ll make it work." For a group exercise this day on inherited versus acquired genetic traits, students pivot the smart pad so Andrew can interact with the group. "Are his ear lobes attached?" asks a girl, leaning closer to the screen. "Show us your tongue, Andrew, can you curl it?" Toward the end of class students swing by "iAndrew" to say goodbye. Andrew has always been a "straight A" student, said his mom, Stacie Gardner. But school became even more important to him after a near drowning three summers ago permanently damaged his lungs and ended his participation in sports. During a family raft trip down the Salmon River in Idaho, Andrew&apos;s foot got caught on a rope when the raft hit a rock and flipped, dragging him underwater for 10 minutes, she said. It took 17 minutes to resuscitate him. His acute respiratory distress syndrome stems from the dirty water that flowed in his lungs. He spent a month in a hospital on a ventilator and two years on oxygen, Gardner said. Andrew uses inhaled steroids to reduce inflammation and every night he has to wear a "percussion vest," used to pound and release mucus from the lungs of patients with cystic fibrosis. He&apos;s getting better, she said, and needs oxygen only when he&apos;s sick or pollution sets in. &apos;Like being smothered&apos; • But the winter of 2013 was particularly rough for Andrew, who caught swine flu right around Christmas and then the virus known as RSV. Then, just as the holiday break was ending, pollution levels spiked. It felt like "breathing through a straw, like being smothered," Andrew said. His pulmonologist joked about shipping him off to live on the East Coast. "I said, &apos;My parents live in Mesa, Arizona. Maybe I&apos;ll have him go down there,&apos; " recalls his mom. "She said, &apos;You know, that&apos;s not a bad idea.&apos; "
"We&apos;re trying to balance how we can keep him involved socially, too," she said, "when he goes down to Arizona to spend three weeks with older people in a retirement community." The cost of sending him from Sandy to Arizona is minimal, she said. "For us, it&apos;s more of a mental thing. It&apos;s hard on my two younger kids seeing their older brother sick and having to say goodbye." But she sympathizes with other parents of medically fragile kids who can&apos;t easily escape the bad air. What we did • The Salt Lake Tribune obtained daily counts of school absences for the 2011-12 and 2012-13 school years in four school districts: Salt Lake City, Provo, Alpine and Park City. The Tribune asked Brigham Young University economist Arden Pope to plot the absences against daily pollution counts, or the average daily measures of fine particulates at four monitoring stations within those districts. Results • Preliminary findings for 2011-12 reveal no obvious connection between school absences and that season&apos;s moderate pollution spikes. But during the record-high pollution levels of 2013, absences in Salt Lake City, Provo and Alpine districts soared. In Park City, which rests above the valley&apos;s winter soot-trapping inversions, there were no clear spikes and absentee rates remained similar. What we learned • The data suggest a link between pollution and student absenteeism, said Pope. But more analysis is needed, he added, to account for seasonal variability, such as flu outbreaks and bulges in absences near holiday breaks and weekends. A pollution effect? The number of days when more than 7 percent of a school district&apos;s student body was absent are shown below. Enrollment totals were calculated differently each year, making an exact comparison based on percentages impossible. But the results show more high-absentee days in the high-pollution year of 2013. During the 2013 winter pollution season, from Dec. 1, 2012, to Feb. 28, 2013, the median number of daily student absences rose by the following percentages. P C. Arden Pope III is a distinguished professor of economics at Brigham Young University. Pope is regarded as a leading authority on air pollution epidemiology for his series of studies in the late &apos;80s and early &apos;90s linking pollution to premature death, hospitalization for respiratory problems and death from lung cancer and heart disease.